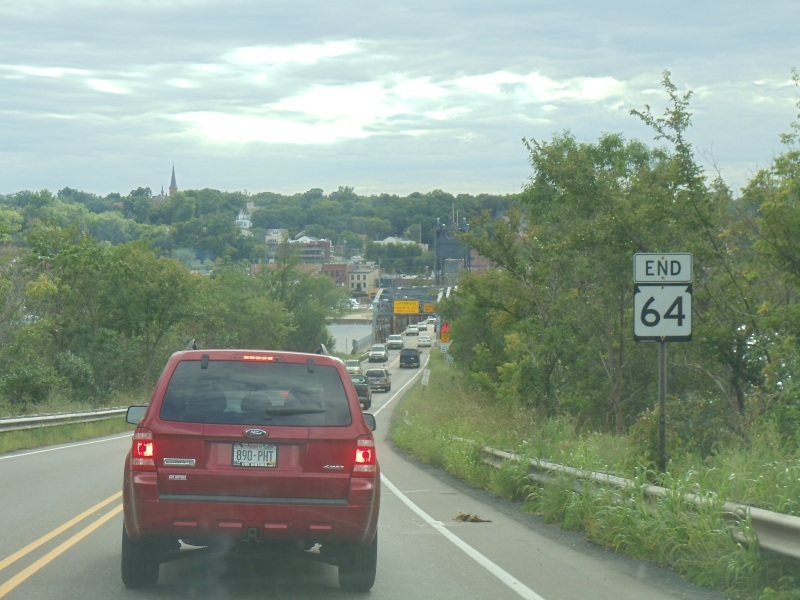 Quickie Summary: State “Trunk” Highway 64 is another “coast to coast” highway, connecting the twin cities of Marinette and Menomonee, MI, with the fast-growing northeast suburbs of the twin cities of Minneapolis and St. Paul. Forests, Main Street USAs, state forests, a variety of terrain, and wide-open rural driving all await you in between. 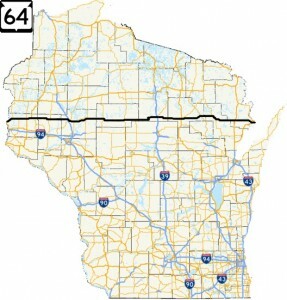 Highway 64 begins as an offshoot from U.S. 41 in Marinette, about 1/2 mile in from the Michigan state line. 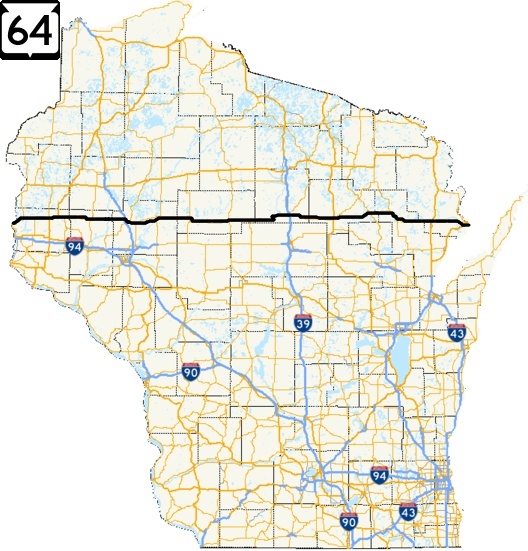 Highway 64 begins in Marinette (pop. 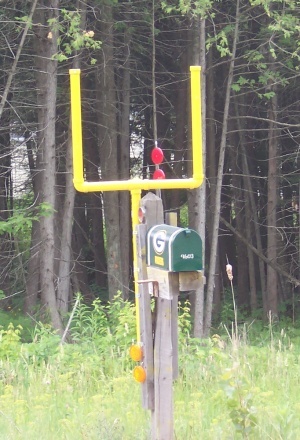 11,749) at U.S. 41, just short of the Michigan state line and Marinette’s over-the-river twin city, Menomonee. Marinette’s location, where the hard-working Menomonee River flows into Green Bay, cemented its destiny to be a logging town in the 1800’s. Named after an early Native American fur trader’s common-law wife, Marinette is the county seat of Marinette County, Wisconsin’s largest by land area… yet Miller Park at capacity for a Brewers game holds more people than Marinette County has residents. Marinette – the city – has a nice downtown within a few blocks of the river along U.S. 41 just east of where Highway 64 begins and serves up numerous options for boating and fishing. Its “twin city” sister, Menomonee, Michigan, lies right across the Menomonee River. The two cities boomed in the late 1800’s when lumber came from forests upstream and were loaded onto ships at the docks of Green Bay. The two city’s main high schools share one of the oldest interstate rivalries in the U.S. It’s also where the 2005 film The Godfather of Green Bay was shot. The main bridge between the two cities carries U.S. 41 and was reconstructed in 2007. Stephenson Island is in the middle of the river; a nice pedestrian bridge allows a stroll there. There’s also a Wisconsin Welcome Center at the U.S. 41 bridge – as well as a Michigan Welcome Center on the other side. 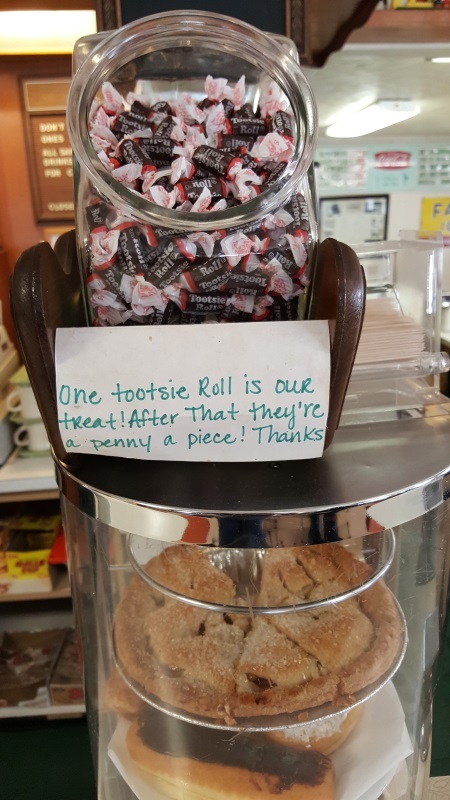 This is actually Mickey-Lu’s deal with Tootsie Rolls. 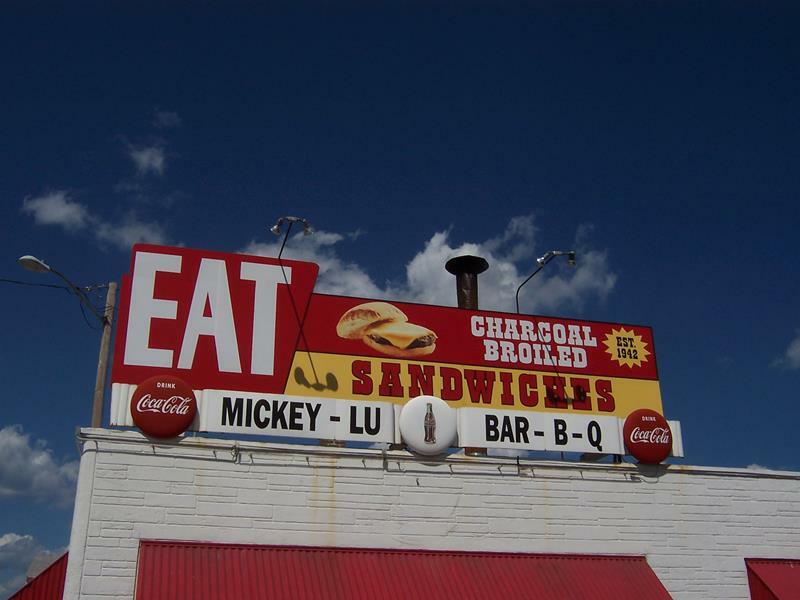 Mickey-Lu’s – from the outside to the brick-lined charcoal grill, from the 1950s era jukeboxes to the tasty little burger itself – is a chow-down pleasure. Further south, the Rail House Restaurant & Brewpub (2029 Old Peshtigo Road, 715-735-9800) houses 11 microbrews from the Rail House Brewing Company, including a delicious Silver Cream, a Blueberry Draft and a hoppy Big Mac IPA. Try the sampler! 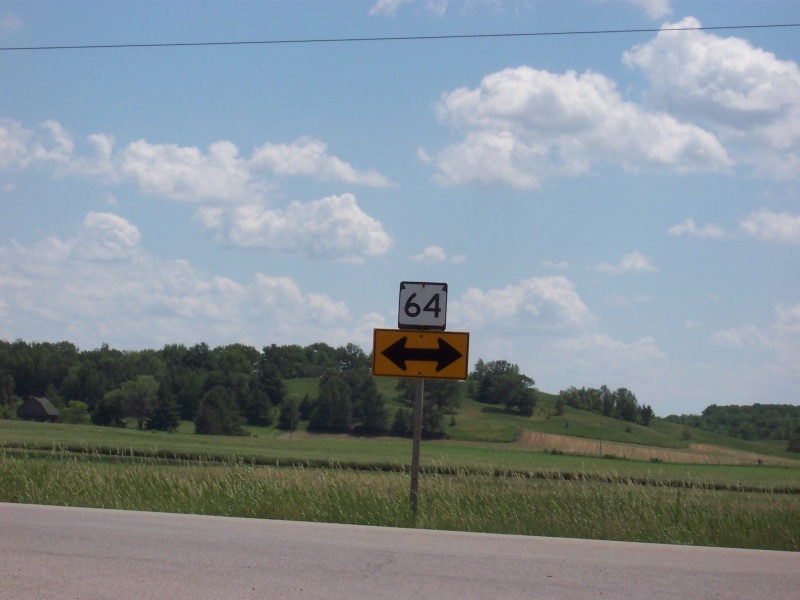 Highway 64 begins about 1/2 mile from Michigan as a western offshoot from U.S. 41. Beginning with a slow push past some residential neighborhoods (Highway 180, which runs along the Menomonee River to Wausaukee, angles off in Marinette’s west side) and over the Peshtigo River just outside of town, Highway 64 becomes a straight shot west for about 15 miles before intersecting with the newly-expanded 4-lane U.S. Highway 141 and grazing the northern edge of Pound (pop. 484). Pound is part of the Lena-Coleman-Pound-Crivitz stretch of towns that run north-south along U.S. 141 in central Marinette County. 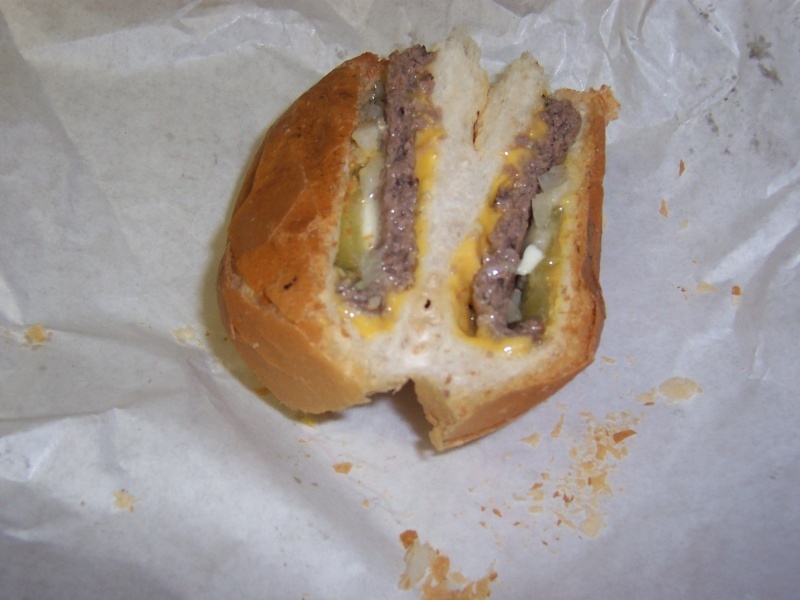 Pound itself is a small burg that was once featured in national commercials for a weight loss company (“How many pounds did the people of Pound lose?”) where the town’s residents lost a collectively sizeable amount of weight. 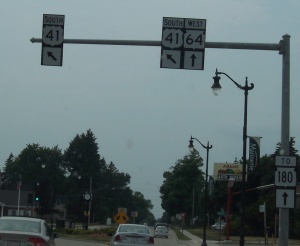 Highway 64 grazes the northern edge of Pound with an interchange at U.S. 141 and a connection to County CP, which is the original U.S. 141 and connects to the heart of Coleman and Pound (hence the CP.) 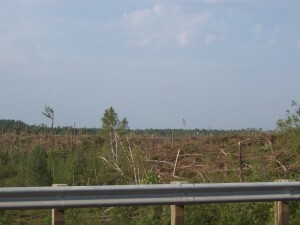 From here, Highway 64 makes another beeline west, over rolling hills into Oconto County and the Chequamegon-Nicolet National Forest. It’s less than an hour to Lambeau Field in this stretch west of Pound along Highway 64, where Packer fans aren’t shy about their allegiance. No word on if the mailman ever drop-kicked letters or packages through the uprights. 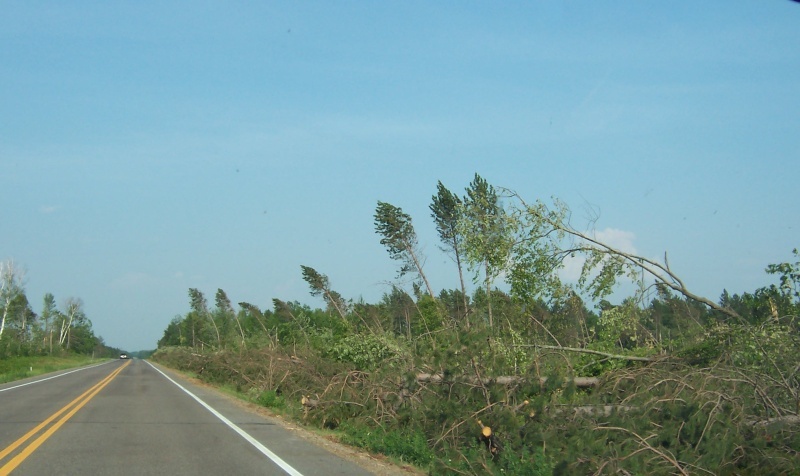 West of Pound, Highway 64 enters Oconto County, straddling the line for about two miles. At a hilltop right by County Z is a great butcher shop called Meatski’s, where a quick stop for sausages and jerky is always a great idea for fans of said foodstuffs. 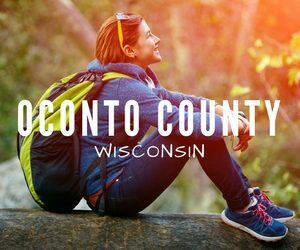 Oconto County is officially part of the Green Bay Metropolitan Statistical Area, so despite your current relatively rural location, you’re in a “metro area.” The County runs from the waters of Green Bay and its county seat, Oconto, and stair-steps northwestward through the Oconto River Valley and into higher ground within national forestland. Highway 64 heads mainly through the latter; it’s an area filled with forests, ATV and recreational trails, and outdoor adventure opportunities. Highway 64 travels through some beautiful, wide open spaces like here, just east of Mountain. Which is interesting, because there are no mountains around. The Chequamegon-Nicolet National Forest covers wide swaths of northern Wisconsin; Highway 64 travels through parts of it in Oconto, Langlade and Taylor Counties. 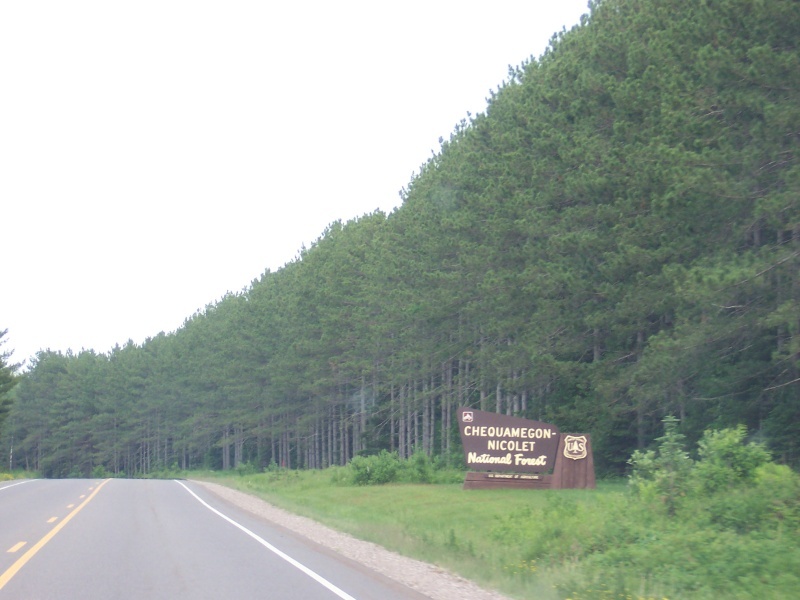 Highway 64 runs a beeline westward for and reaches the boundary of the Chequamegon-Nicolet National Forest, a 1.5-million acre wonderland of old growth and replanted forest land. The eastern part of the state primarily holds the Nicolet portion. Just inside the Forest boundary, Highway 64 curves slightly and meets Highway 32 for a trip into the town of Mountain, which goes on along the road for several miles. This unincorporated town, with a center around the intersection with County W. It’s a popular stretch for stores catering to visitors hunting, fishing and snowmobiling in the area since two major state highways run together here for about six miles. It’s a good stop for gas, sacks, or other refreshments. Just past the center of Mountain, Highway 32 breaks away to head north and 64 continues westerly through more of the forest and into Langlade County. 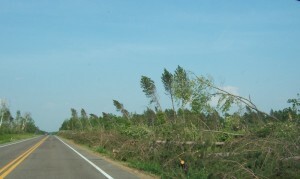 A TORNADO’S POWER: Taken along Highway 64 in June of 2007 just after a tornado cut a wide swath through parts of the Chequamegon-Nicolet National Forest, these show just how strong the winds of a tornado can be. This was solid forest prior to the storm. Just inside the county line, you cross Highway 55 and the crossroads of Langlade (pop. 472), along the Wolf River. 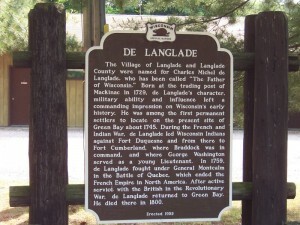 A marker at that junction describes the town and county’s namesake, Charles Michel de Langlade, as the “Father of Wisconsin” (pictured below). 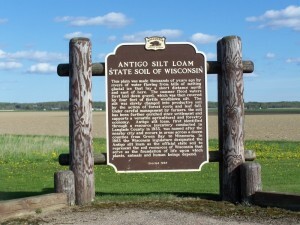 A series of lakes and rivers dot the landscape around Highway 64 continuing westward, past settlements like Elton (not named after the singer, apparently) and Polar, past the Ice Age Trail, picking up Highway 52 and heading towards the county seat, Antigo. Langlade County’s namesake, Charles Michel de Langlade, is commemorated at Highways 55 & 64 with this marker. 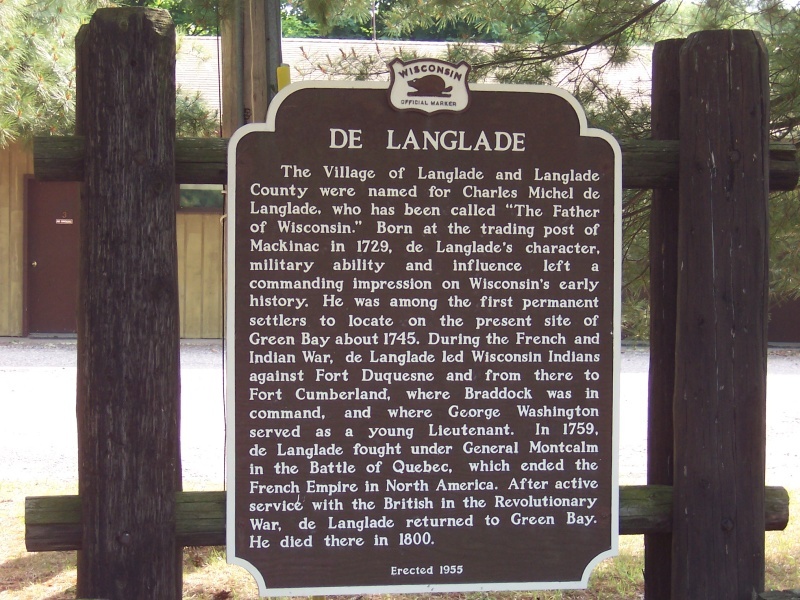 Langlade was one of Green Bay’s first settlers, fought in several wars and led, among others, a young guy named George Washington. The Elton Schoolhouse, opened in 1912. 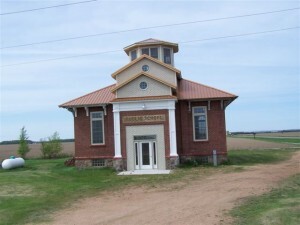 Elton Schoolhouse after its 2009 restoration. See these above? 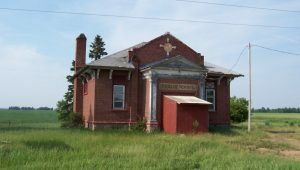 A nice before and after between Elton and Antigo, the Elton Schoolhouse opened in 1912 and closed several decades ago. It looked charming but decrepit when I first drove by it on Highway 64. By 2009, the Elton School Preservation Society had arranged for its restoration and today the Elton Schoolhouse serves as a small museum. State Trunk Tour reader Agnes Wiedemeier drove by provided the new photo (thanks, Agnes!) and you can tour the school by appointment (call Donald Rose at 715-882-3008 or Carl Zuelke at 715-882-2112) and check out local artifacts in there, including an old chalkboard signed by residents and visitors who attended the school. Neon Heaven. On the north side of Antigo is Northern Advertising, which among other things makes neon signs for companies around the U.S. Somewhat visible by day, this building shines in the nighttime, with neon signs from Blatz, Oldsmobile, Rexall Drugs, and even the old Red Owl stores beaming along the roadway. 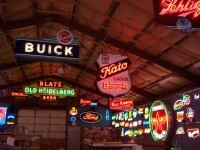 Inside is an incredible collection of neons: some custom, some originals from the 1930s, some great replicas. 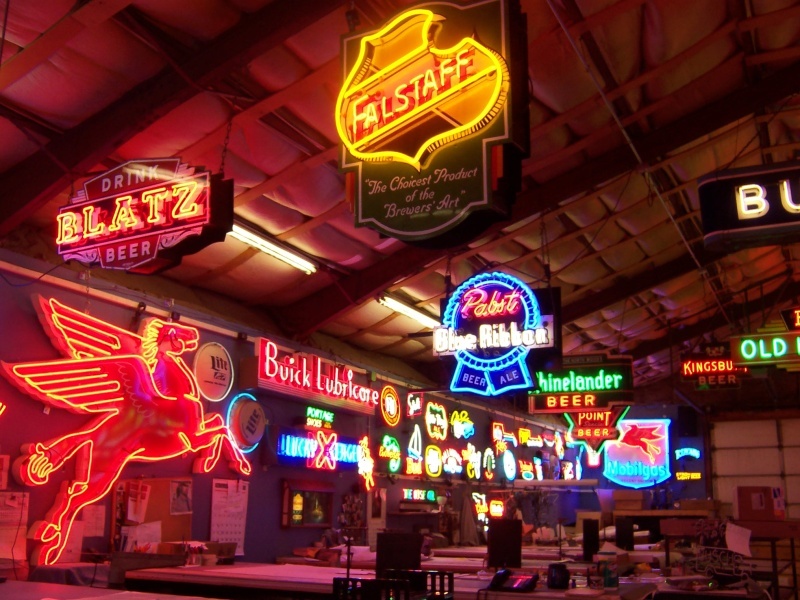 It’s one of the largest neon collections in the world in one area. 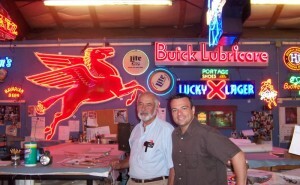 The owner, Dean Blazek, makes signs and has two sons, one in Seattle and one in Australia, who also make them and send them to destinations around the world. 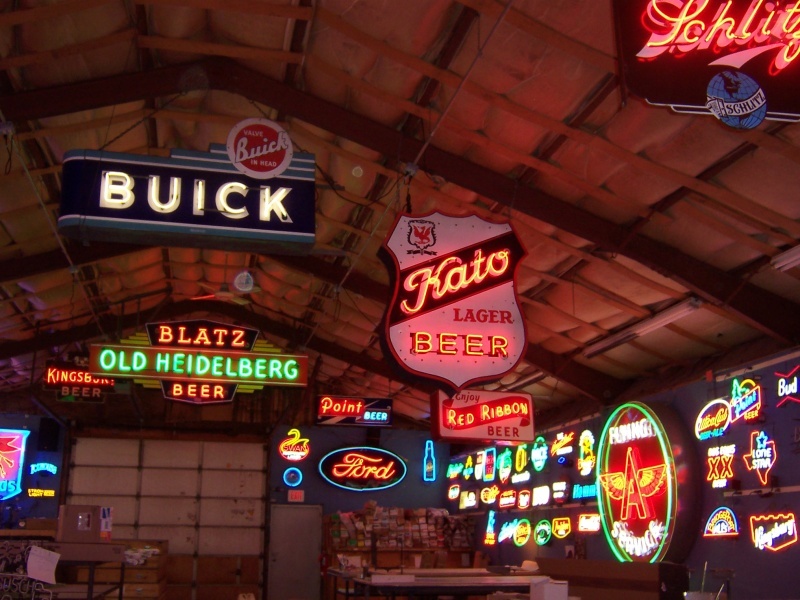 This is just a sample of the phenomenal collection of neon signs Northern has. My mouth rarely hangs open when I look at things, but that was the case looking around here. At bottom, owner Dean Blazek showed me around and stopped shaping glass long enough to pose for a picture. 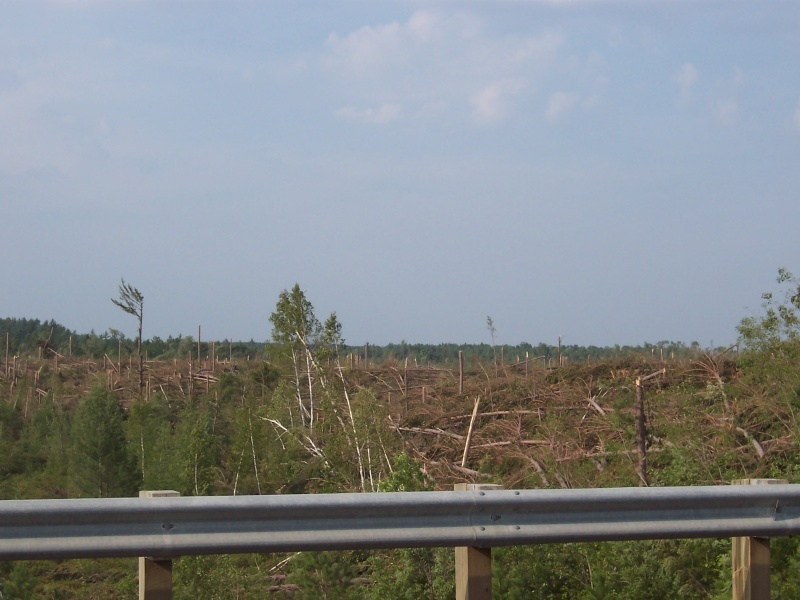 Highway 64 meets up with U.S. Highway 45 and Highway 47, where you head south into the City of Antigo (pop. 8,560). Sitting atop a plateau about 1,500 feet above sea level, it’s been an over 900-foot climb since the start of the route in Marinette. 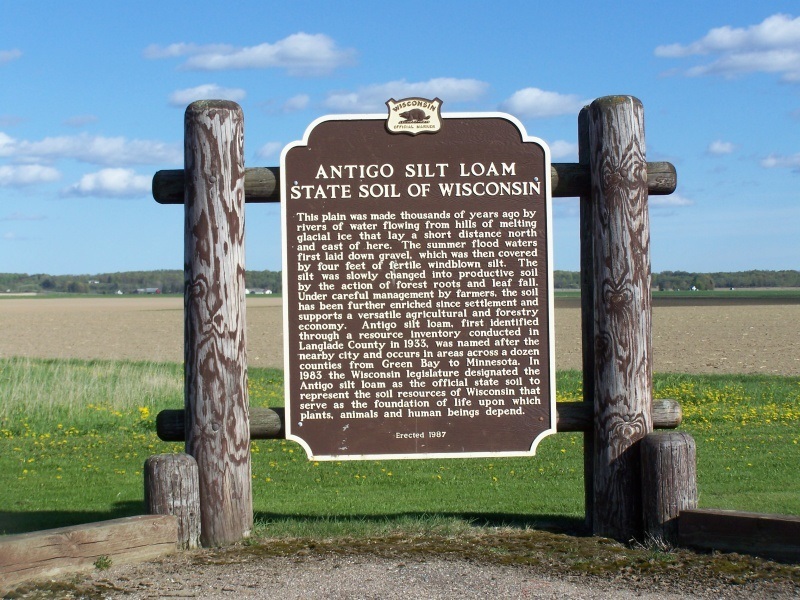 Wisconsin’s state soil since 1983 is the Antigo Silt Loam soil, named, of course after the city. Antigo bustled with sawmills 100 years ago and today still hosts a series of industries dealing with lumber, as well as farming, food production, shoes, fertilizer and steel and aluminum products. 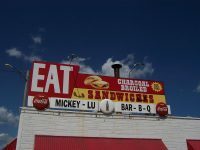 It’s a popular stop for tourists on their way to points north and east in the North Woods, so expect a full variety of restaurants and stores, including a Super Wal-Mart. 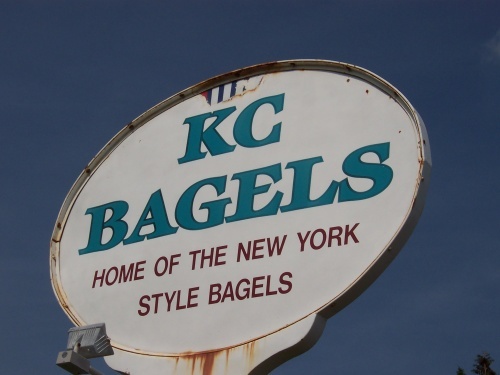 This just confused me… KC Bagels are NY style… in Antigo. 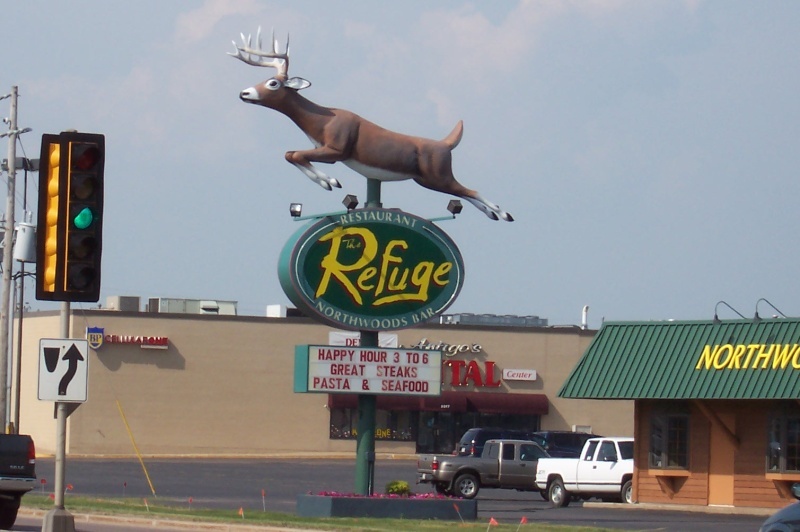 Large deer are abundant in northern Wisconsin; only a few are plastic and have the patience to hang out atop restaurant signs, though. This is at the corner of Highway 64 where it meets up with U.S. 45 & Highway 47. Highway 64 once joined U.S. 45 and Highways 47/52 for the ride downtown; today, 64 continues west from that busy intersection on the city’s north side and bypasses the town to the north and west by itself. To see Antigo’s main points of interest, you need to head south along 45/47/52 past the Langlade County Fairgrounds to downtown. 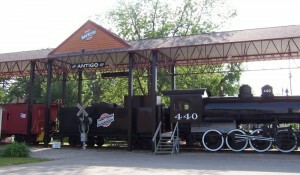 The railroad was important to Antigo, especially because of its logging industry. Along with Highways 45/47/52 just south of downtown, you’ll find the Langlade County Historical Museum & Railroad Park, which includes historic artifacts inside a 1905-built Carnegie Library, a classic 1800s cabin, and an original 1900 stream locomotive that is on full display. All are available for tours. Merrill alllll the way west to Stillwater, Minnesota is COMING SOON! Keep watching the site for developments… but in the meantime, here’s the west end! 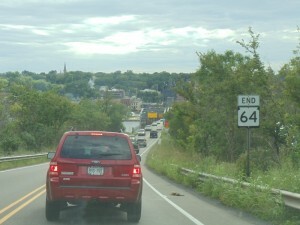 Highway 64 comes to an end on the bridge to Stillwater, Minnesota, which you see in the background behind the “END 64” sign. The Stillwater Lift Bridge opened in 1931. 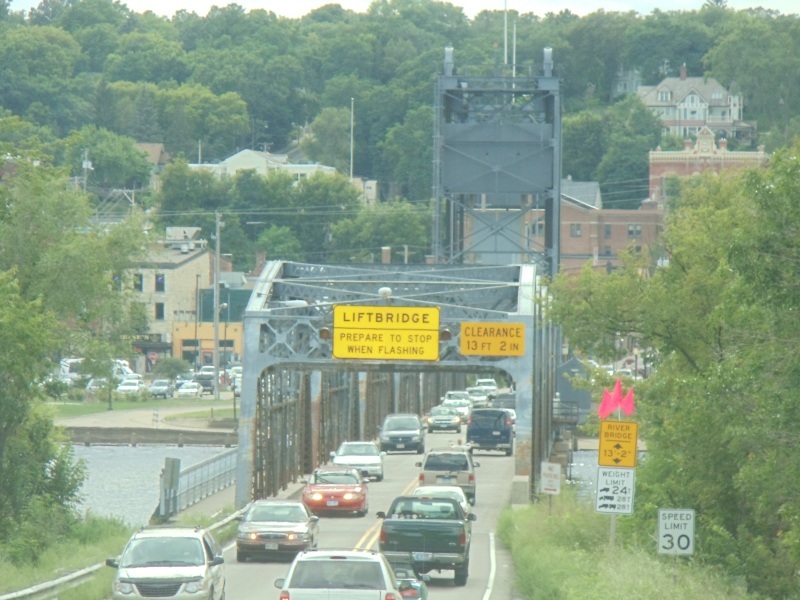 Particularly on summer weekends, this bridge carries plenty of traffic between Wisconsin and Minnesota. The newer, high-speed bridge construction is underway.